Let’s face it. Allot of sim racers are suckers for smooth framerates and photorealistic gameplay visuals. As we all know, these goodies are mainly the product of a high-end video card. While the last few years both Nvidia and AMD have blessed us with a line-up of very impressive graphics cards, we are always on the lookout for the new tech behind the corner. Now the day has come. During the Nvidia 2018 press conference at this years ongoing Gamescom trade fair in Cologne Germany, Nvidia’s CEO Jen-Hsun Huang dropped a bombshell. He announced three new RTX 2000 GPU series video cards, which are advertised as having 6 times more performance as the current gen cards, and feature real-time ray tracing functionality. He called it a revolutionary leap in consumer graphics power. Based on Nvidia’s new nVidia Turing architecture, the RTX 2080 is designed to succeed the popular GTX 1080 flagship bring real-time ray-tracing and deep learning capabilities to the gaming market. Even better, interested gamers will not have to wait long to get their hands on one. Nvidia launched the Reference and Founders Editions of the GeForce RTX 2070, RTX 2080 and RTX 2080 Ti, while they also announced that partner companies such as Asus, MSI, EVGA, PNY, and Zotac have their respective standard and overclocked variants of the GeForce RTX Cards ready for pre-order as of now. The RTX 2080 and RTX 2080 ti cards should hit the shelves on September 20th, followed by the entree-level RTX 2070 in October. Interestingly, the base model RTX 2070 will still beat the performance of a very expensive Nvidia’s Titan XP card. As usual, all introduction prices are based on the American market. Actual pricing for Europe and the rest of the world is not yet known. For detailed specs check out the offical nVidia website. Sim Racing enthusiasts who visit this years Gamescom will have the opportunity to see the next-generation Nvidia Geforce RTX 2080 Ti in action. 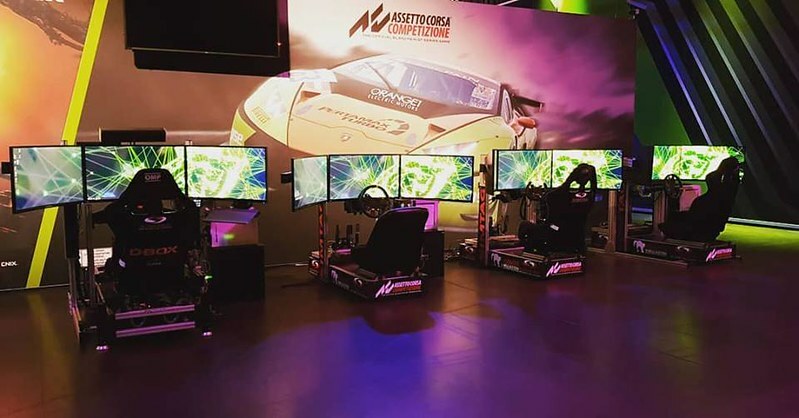 The Belgium-based SIMTAG SPRL company has four of their racing simulators on site, equipped with the new Nvidia Geforce RTX 2080 Ti running the upcoming Assetto Corsa Competizione, the official Blancpain GT Series Game by Kunos Simulazioni.